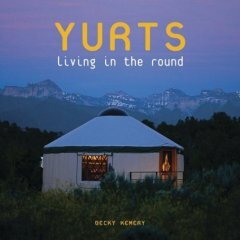 Ever since I first heard that Becky Kemery was writing a book about Yurts I have been looking forward to having it in my hands. The wait has definitely been worth it, now that I can see how fully realized her idea has become. Yurts: Living in the Round was published in 2006 by Gibbs Smith, and is the definitive source of information about anything to do with yurts. Not only that, it is also a fine piece of art in its own right; nearly every page is graced with carefully laid out color photos and drawings. Becky's writing is both clear and well researched. Becky writes, "Most yurts are portable, tent-like structures. They have circular lattice walls (reminiscent of baby gates tied together) and a cone-shaped roof supported by rafters that meet in a center ring. The outer fabric shell of the yurt can be made of felted wool, coated canvas, or a modern architectural fabric. An ever-increasing number of wooden structures are also called yurts. What defines them as yurts and not just round houses? The Answer lies in the yurt's uncommon roof structure." "The yurt roof incorporates a unique architectural design. Roof struts meet in a center ring, producing inward and downward pressure. This center ring holds the rafters an a state of compression. Where the struts meet the wall at the perimeter, a natural outward thrust occurs. A band (of rope, woven cloth, or wire cable) a the top of the wall holds the wall and roof poles in tension against this outward pressure. Because of this...long roof spans are possible without any internal support system (like posts, trusses, or beams). This gives the yurt an uncommon feeling of spaciousness and uplift. the roof design also creates an incredibly strong and resilient structure that is uniquely equipped to withstand earthquakes, strong winds, and heavy snow loads." The historical evolution of the modern yurt from its origins with the nomadic Central Asian tribes is carefully outlined. Both the Mongolian Ger and the Turkic Uy are the forerunners of what we now call the yurt. How these tribal folks traditionally make and decorate their portable homes is both fascinating and colorful. This process is generally a group effort and often involves painstakingly felting the wool to make the covering. The traditional pattern of living within this circular space is surprisingly similar to Native American traditional use of space within a hogan, with various family members and guests having their appropriate places. One of the early modern adaptations of the traditional yurt design was Bill Copperwaite's "tapered wall yurt." These are wooden structures that incorporate the same roof design, but modify the vertical walls to incline outward, giving them a distinctly oriental flare. Bill has been exploring these interesting shapes since the early 1960's, and has come up with quite a variety of forms, including some with concentric tiers of yurts within yurts. Some of them have scalloped butterfly-like roofs; others have gothic arches that surround the perimeter. The modern fabric yurt is more like its nomadic predecessor, in most ways, except that modern canvas or synthetic fabric replaces the felted wool. Becky chronicles how various people have adapted the original designs to suit modern needs in a variety of climates. Many of the new yurts have central plastic dome skylights and windows that let in lots of light, making them much more open and airy than the darker, womb-like nomadic yurts. Many of the folks who have experimented with building their own yurts have gone on to make a business of supplying yurt kits for the general public. Becky suggests how to locate and evaluate these yurt companies, and describes various ways that yurts can be adapted for personal needs, such having a bathroom, porch, heater, etc. She even addresses the issues of financing and insuring yurts, and dealing with building code officials. Another modern adaptation to the traditional yurt is called the "frame panel" yurt. These are much more permanent dwellings than their fabric cousins, and can appear as very solid indeed. They are often prefabricated off-site and shipped to the site for erection. Becky interviewed various people who have lived in these unique homes and shares many insights that could help others who do the same. The chapter titled "Living in the Round" philosophically evaluates the merits of doing this. Becky writes, "The flexible open space of a yurt is an interior design canvas waiting for the creative expression of each yurt inhabitant. What remains constant is the welcoming embrace of the space, the interaction between inner and outer worlds, and the roof structure that lifts our vision skyward. The yurt also has an inherent ability to bring people together into a circle, which naturally engenders connection and cooperation." The final portion of the book has several appendices that explore building codes, platform construction, and wood stove installation. There is also an extensive resource guide here for yurt companies, yurt plans, and other media. Becky's website about yurts, www.yurtinfo.org, is another resource providing additional information. I heartily recommend this book to anyone interested in simple, sustainable living, enduring vernacular architecture, or the possibilities inherent in living in the round. Great information, thanks. The book I was waiting for without even knowing it! I was wondering whether the book addressed strawbale yurts such as the one in North Crestone Town, and what type of roof insulation options either she addresses or you'd recommend as far as ease and effectiveness. Also, another idea that's been percolating through my brain for a while now is the water heater/hot tub based on a rocket stove, coils, and tight insulation for a radiant raised floor within such a yurt. I'd love to bounce that in a little more detail at least for first impressions some time. I've just happened upon blogging so am fairly unfamiliar with protocol, but any thoughts would be appreciated. This book does not mention strawbale yurts, but this is obviously another option. The insulation package in many commercial yurts is often a Refectix- type bubble foil material. Other options include felted wool (traditional...and effective if kept dry). The more permanent panel yurts can employ thicker forms of insulation, like ordinary houses use. Your water heater/hot tub idea could well work. I made a hot tub with standard pex tubing that is used for radiant floors coiled in a concrete pad on the base of the tub and connected to a solar water heater...and it worked great. I have a yurt and really love it. Unfortunately, the mice do also. They chew on everything in the yurt, including the wooden floor. Any suggestions? I'm wondering how mice are getting into your yurt. My experience with yurts is that they are much more mouseproof to begin with than conventional homes. The only mice I ever had in my yurts were those that my cat actually brought in. There shouldn't be gaps between yurt cover and platform where mice can get in. Not knowing what kind of yurt you have, I would suspect that your mice are entering through holes in the floor where your plumbing and electrical are routed. I would start by plugging those holes, perhaps using spray foam around the incoming receptacles. If you're not able to keep mice out of your yurt then you'll have to resort to the usual solutions--no food available (all food stored in glass jars, enclosed garbage and compost, dishes cleaned right away), mouse traps of one sort or another (live or deadly) or a cat that's a good mouser. Even "cat sitting" for an out of town friend for a few weeks might help. I am waiting for my copy of the book, but I had a question in the meantime. My husband and I are going to be caretaking property in Montana, at about 6500'. We have been looking at housing options that are quick AND affordable. I have always been intrigued by round houses, and I am facinated by yurts. As cost is a factor, we are thinking of purchasing a yurt, and then next year replacing the canvas with convential siding and roofing to make the structure more permanent. My husband is a master carpenter, so he has the skills to do this. However, I can not find any information on anyone doing this, and I am not sure if it is even a feasible idea. We are thinking of this as we will be dealing with -30 degree temps, snow loads, high winds, and small children. Do you have any information on anyone doing this? I have also searched for information on plans to build a permanent yurt (is that an oxymoron?) but the largest I can find is a 16' diameter, not nearly large enough. Is there someplace we could find this information? The yurt would be off-grid using hydo power for electricity and a wood stove for heat. I have heard of people trying to add conventional siding to a fabric yurt but wouldn't recommend it. The trellis wall is strong in part because it is part of a tensioned structure, with the compression ring at the top of the rafters and the steel cable tying together rafters and wall. You lose that flexibility and tensioned aspect when you add hard siding (the beauty of the trellis wall is its portability; it isn't meant to be turned into a permanent structure). My suggestion would be to go to the Yurt Companies page at www.yurtinfo.org and research frame panel yurts. Wall plans are available with a roof kit from Smiling Woods Yurts (www.smilingwoodsyurts.com). There's a new company, Round Foot Homes, that provides plans for a SIPs panel yurt (check and see if there are any SIPs panel producers in your area). GeoLite (www.geolitesystems.com) also sells plans for a frame panel yurt-style structure. If you put up a fabric yurt first then you can certainly use the platform when you're ready and build a frame panel yurt as a permanent structure. I think this might be what you're looking for, and getting the fabric yurt first will give you some time to save for building and decide on plans. Good luck with your yurt plans!! Author of "YURTS: Living in the Round"